Brilliant joke set up, or brilliant impromptu concert? Watch and see? My name is Kory Reid, currently the Assistant Music Director of the Grammy award-winning, all-male vocal ensemble, CHANTICLEER! I hope this email finds you in good health and in good harmony! :) The Barbershop Harmony Society has been doing some great work with social media and educational outreach - this is due to your divisions' hard work and creativity! Well done! I'm a definitely a fan! I wanted to bring your attention to a collaboration video that CHANTICLEER and CANTUS - the only two full-time, all-male choral ensembles in America - made a few days ago. The impromptu video we made was made possible by an alignment of our touring schedules; I don't think the two ensembles have ever been in the same room together, or SUNG TOGETHER... ever! We decided to sing the indelible "Ave Maria" by Franz Biebl for this momentous occasion. We did not practice, nor is it a performance, but it functions more as bridging the gaps of the two popular choral groups in the country, promoting community singing, and showcasing homophonic men's close harmony. 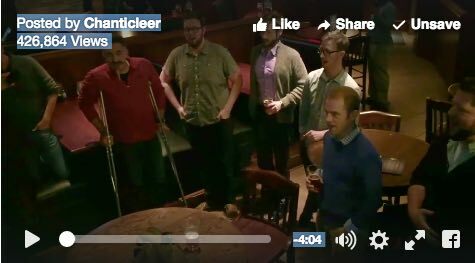 The video can be found at... https://www.facebook.com/Chanticleer-6144333740/?fref=ts or if you have a FB account, it's on our Chanticleer page. The Westminster Chorus has also sung this piece in the past. Feel free to share!!!! As a past member of the Westminster Chorus (Int. Champs 2010 in Philadelphia) and a District Finalist in the FWD quartet contest in 2009, I love barbershop singing and promote it across the globe. After Chanticleer concerts (which range from 100-120 concerts/year), I always get a few to a dozen barbershoppers wanting to talk to me about the barbershop style, the BHS organization, my competition history, or a request to sing a tag. I always sing the tag - even after a 2 hr concert - because I believe in the power of barbershop singing and always making yourself accessible to aspiring singers! I think it's important for choral music and barbershop music to crossover... we play the same ballgame with different colored jerseys. One of the pillars of Chanticleer's and Cantus' mission is education outreach. You must know that as ambassadors of choral music, we not only try to recruit and educate choral artists, but also expose them to the barbershop style as well. I hope, one day, we can meet and discuss ways in which we can crossover, either musically or educationally. I'm an educator myself with a BA in Music Education (Pepperdine University) and an MM in Choral conducting (University of Southern California), so please know I'm very accessible and will do all I can to promote the choral/barbershop art in any way I can. Kory Reid Assistant Music Director Chanticleer, "An Orchestra of Voices"